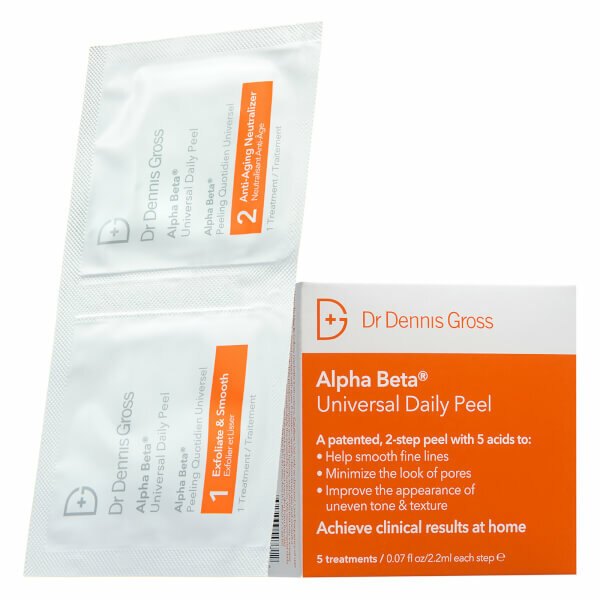 Target and treat the common signs of ageing with Dr Dennis Gross Skincare Alpha Beta Universal Daily Peel, a pack of 5 skin peels that use the original, iconic formula. 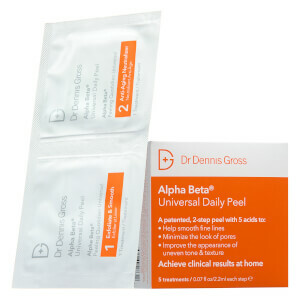 The two-step treatment uses a combination of five potent Alpha and Beta Hydroxy Acids to help even the skin tone and texture, reduce the appearance of wrinkles and minimise enlarged pores. Step 1 uses a gentle exfoliating action to resurface the complexion, leaving it smooth and radiant, while Step 2 restores intense hydration and nourishment for a refreshed, rebalanced appearance. Resveratrol uses antioxidant benefits to create a protective veil over the skin, defending against damage caused by free radicals and other environmental aggressors. Expect a strengthened, revitalised and visibly glowing complexion. Free from parabens and phthalates. Vegan and cruelty-free. Step 1: Water/Aqua/Eau, Alcohol Denat. 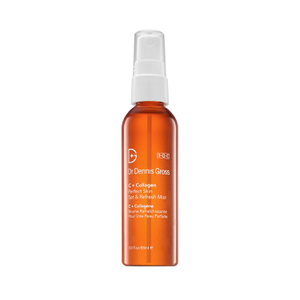 (SD Alcohol 40-B), Glycolic Acid, Potassium Hydroxide, Hamamelis Virginiana (Witch Hazel) Water, Salicylic Acid, Polysorbate 20, Citric Acid, Lactic Acid, Malic Acid, Camellia Sinensis Leaf Extract, Achillea Millefolium Extract, Anthemis Nobilis (Chamomile) Flower Extract, Soy Isoflavones, Copper PCA, Zinc PCA, Lecithin, Disodium EDTA, Alcohol, Polysorbate 80, Fragrance (Parfum), Linalool, Benzyl Salicylate, Benzoic Acid, Phenoxyethanol, Sodium Benzoate. Step 2: Water/Aqua/Eau, Sodium Bicarbonate, Ascorbic Acid, Ascorbyl Palmitate, Retinyl Palmitate, Retinol, Tocopheryl Acetate, Resveratrol, Ubiquinone, Achillea Millefolium Extract , Camellia Sinensis Leaf Extract, Leuconostoc/Radish Root Ferment Filtrate, Soy Isoflavones, Phospholipids, Copper PCA, Sodium PCA, Zinc PCA, Dimethicone, Lecithin, Polysorbate 20, Polysorbate 80, PEG-30 Stearate, Octoxynol-9, Alcohol, BHT, Tetrasodium EDTA, Sorbic Acid, Sodium Benzoate, Phenoxyethanol.